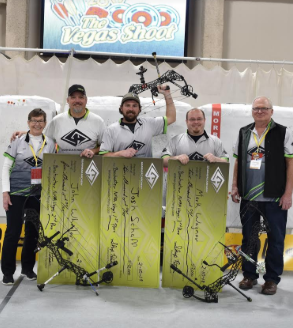 Congratulation to Josh Schaff of Billings Montana on winning the NFAA Bowhunter Freestyle Championship in Las Vegas on February 10th, 2019. Josh was shooting his Gearhead T24 Carbon and posted scores of 299, 299 and 297 with 65X for the big win. John Wheeler of West Virginia, shooting the new Gearhead B40 shot a 297, 299, 299 with a 59X count for second place. Mark Wagner of Iowa completed the sweep with a 299, 297, 298 performance with 62X from his new Gearhead B36. Justin Ertel of Missouri added a top ten score to complete the dominating results from Gearhead bows. “Gearhead Archery enjoyed back to back wins in the Bowhunter class in Vegas. Last year we had 5 in the top ten, with Eric Griggs winning it and now this year with a sweep, I could not be happier. Coming to market with such new and different designs has its share of challenges but delivering a product that gets results is so rewarding” said Skip Peterson of Gearhead Archery. Gearhead’s bridge style, shoot-though riser is the foundation of this sweet shooting bow. Built to withstand incredible loads without deviation, the Gearhead Archery boss-and-pocket design provides the most stable riser platform on the market. Throw in a smooth draw cycle, a solid back wall and dead in the hand accuracy and it is easy to see why they are gaining in popularity. Eric Rapp; President and CEO added, “Our bows are accurate. The accuracy is inherent in the design. Winning at this level of competition is proof positive of our technology”. Gearhead Archery was launched to create innovative archery products that are designed for extreme shooting and hunting conditions. The company is made up of avid hunters that have a background in designing highly automated robotic equipment for various industries. The Gearhead Archery headquarters is in South Central Wisconsin. Gearhead facilities consist of 60,000 square feet of factory space with multiple departments specializing in the areas of engineering, design, fabrication, assembly and CNC machining.